Even after reading and doing research you will need to put hours of time into experimenting with spring assembly on your doll. As for suede, you do not have to use leather, you can use a thin vinyl fabric. I think the best synthetic fabric is called ultrasuede and it looks the same on both sides. I would recommend something that does not ravel at the edges. I use a non toxic pvc glue to adhere the leather. I hope this helps! 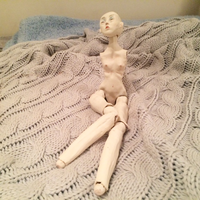 I have another question, in the past, I tried to assembly a porcelain bjd with elastic cord and it didn't come out very well... After stringing the doll with the elastic cord I couldn't pose her(that's the reason I prefer to try springs), I wanted to ask if you know why did it happen and how I to prevent that next time? I also wanted to ask if I can apply tiny eyelashes to my porcelain bjd? you can use epoxy to adhere the tiny eyelashes, they will be cute. Please post photos! I assembled her body and legs with springs but i will string her hands with elastic because they are too small for the springs (she came out so tiny...), her feet will be magnetic. 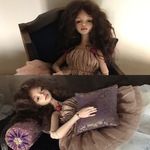 She is the fastest doll i have ever made, I started her two month ago as a project for an exhibition in the arts high school I study at. 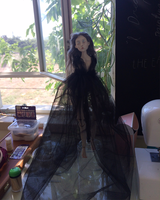 Only one week left until she has to be ready so I hope I will make it on time. My stands take a little while to make because they have a porcelain base. I would suggest purchasing an inexpensive doll stand, taking the holder out and attaching a copper tube to a piece of wood, once the copper tube is attached to the wood you can insert the holder. You can paint the wood or cover it with fabric. just wanted to share a picture from my process... (i already assembled her hands but i don't have a good picture of her with hands). I am so glad to her all put together! She looks great, I hope you were able to meet your deadline at school! 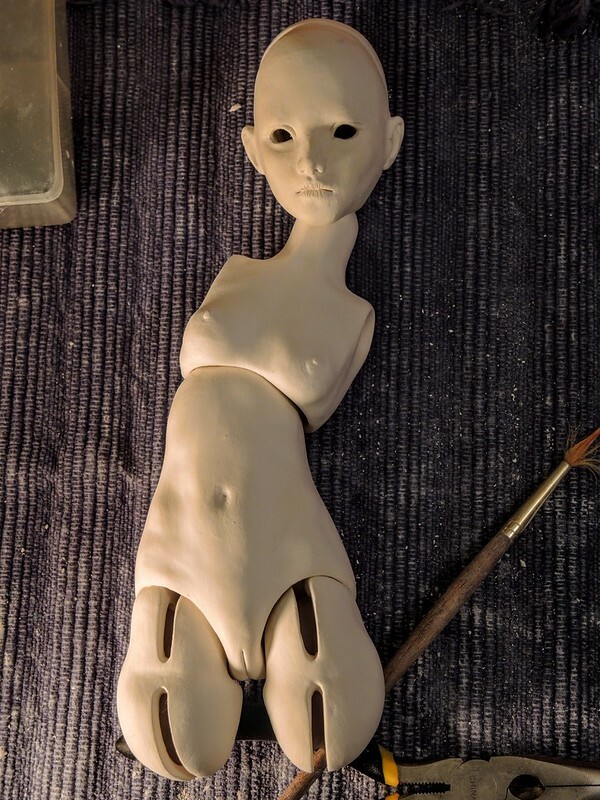 I have started to work of a new bjd phototype and i have some questions. 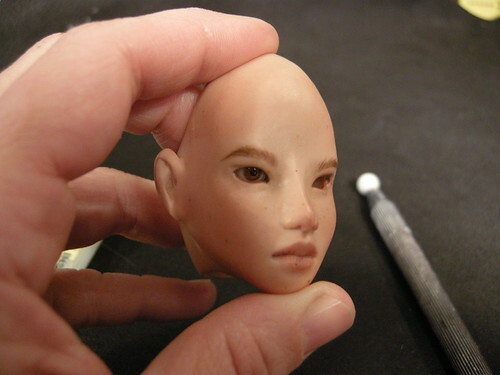 I also don't know how to create and attach the glass eyes to the porcelain doll head since i never did it before; I wanted to ask if any of you know anything about it? Another question I have, is about resin bjd, I really want to cast my doll with resin before transforming her into porcelain but I read that resin is very toxic. I wanted to ask if resin is really that dangerous and if it does, if there is some resin brand or alternative metrial which won't cause any health harm? My last question is about primer, I wanted to ask if sparying the doll parts with primer will conceal the tiny details (for example- the lip line, the nostrills, the fingernails...)? I’m only a collector, not an artist, but I wish you well in your creative endeavor. 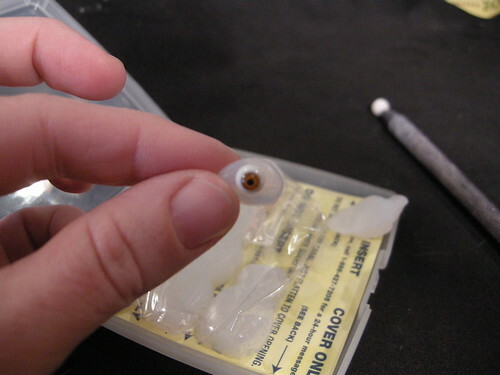 In order to prepare your dolls head for glass eyes you will need an eye beveler. This tool is a tiny sanding sphere that creates a socket behind the eye. If you are using porcelain you will need to order the eye beveler in a larger size than the eye you intend to place in the doll's head because the porcelain shrinks in the kiln. 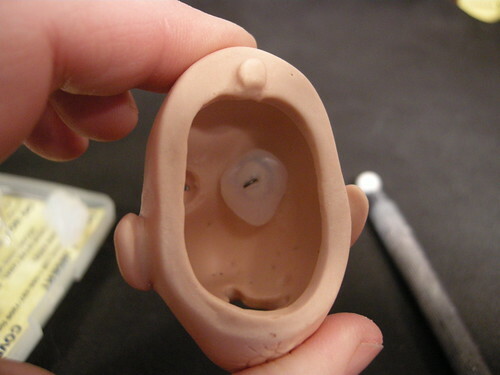 You can attach the eyes with epoxy resin or silicon ear plugs. I use silicon ear plugs, but I am not sure if you can access these where you are. Resin is always toxic. 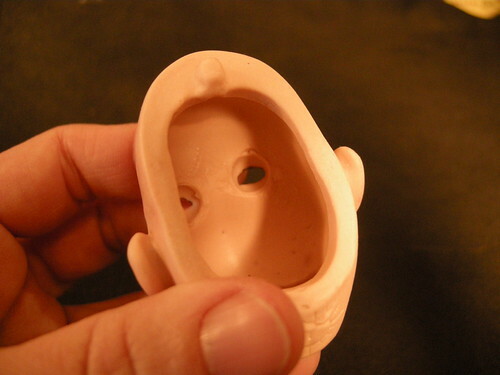 You can only cast your own resin doll if you have a centrifugal machine that rapidly spins the resin in the mold so that it creates a hollow shell. I don't know about resin alternatives, I know that artists who want to cast their dolls in resin usually source them out to a company that specializes in this type of production (harucasting) I don't know anything about primers because I work in clay, I would assume that the product would interfere with the overall surface because you would have to apply it in layers which would build up and obscure fine detail. tinyshirt, thank you so much for your help! I can buy silicone ear plugs, but I didn’t understand how can I attach the eyes with it, can you explain me how to do that? And another question- the head I sculpted is not hollow(I’m working with super sculpey and I haven’t baked it yet, but I’m afraid that if I will make it hollow it’s shape will change...), can I mold the head the way it is and after casting it in porcelain to cut the eye holes (without using the eye beveler)? Hello ayamish your master or original sculpture does not need to be hollow. When you make the mold and pour the slip you will leave the slip in the mold for about 5 min, pour out the extra slip and you will be left with a hollow casting. You can cut the eyes out with a little blade. If you don't use a beveler, the eyes will not get as close to the inside of the eye socket and they will not look very natural. When using the silicon ear plug, I pinch of a small amount and gently push the eye into it, then I push it into the eye socket. Once it's in the eye socket, you will need to adjust it a little with your finger, a pin tool or a pair of tweezers.